I shrugged it off...and then one evening I was just leaving and the gate in front of me shook and clanked and the chain rattled as if moved by a ghostly hand...and there I was face to face with a bloody great badger than had shoved it's hairy ar$se under the gate...ah well. I'm not sure who was most surprised. Still don't like the walk from peg 2 to 3 at night, have to restrain myself from looking behind. Haaaaa ha ha ha ha ! That's brill! Sorry to say that the majority of ghostly happening are explained by either heightened senses from being in an unusual environment (hence SK not having any spooky stories as he seems to spend as much time under a brolly at night as in his own bed!) or sleep paralysis. 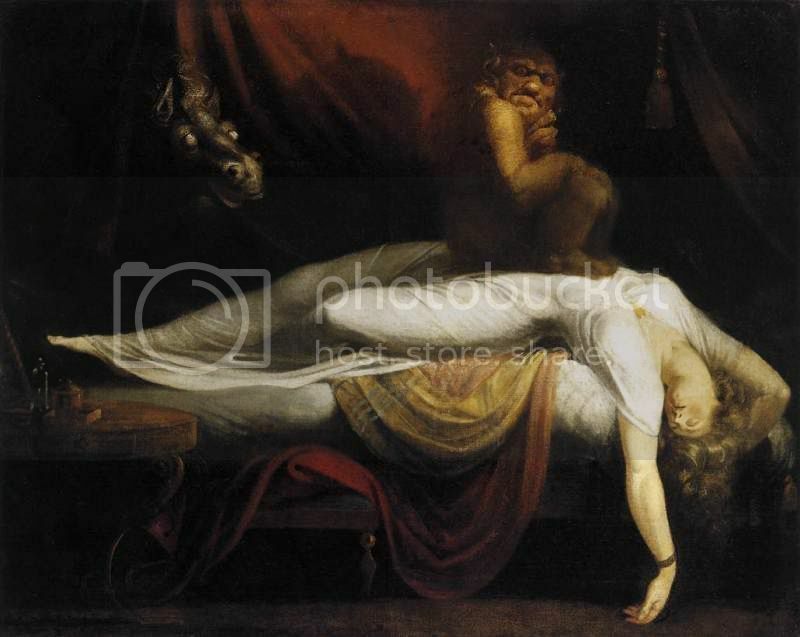 Sleep paralysis, which I used to have all the time: when you become conscious whilst still asleep and the body's self protection mechanism of paralysing itself to prevent it carrying out the actions in dreams feels like a weight is pushing down on you. The apparition is formed by the mind which is still in a REM dream state. All of which seem entirely likely during a night fishing session! And the thing about spending as much time under the bolly than in my own bed, well I worked out the statistics and between April 2010 and April 2011 I actually spent a bit more than half the nights under the brolly. I have heard many stories, including some from The Evening Pitch, about anglers waking but not being able to raise their bodies. SteveW wrote: I am involved in the running of a 3 acre estate lake in Essex that was originally dug in about 1780. The lake is in the grounds of an old manor house that was the home of Admiral John Jervis, 1st Earl of St Vincent (a patron of Lord Nelson) until he died in 1823. It is said that in his later years he used to get a group of the local naval cadets to come to the house and row him up and down the lake in the rowing boat that was moored in the old boathouse (no longer there). That is a brief history of the lake. - A member night fishing was awoken by a strange noise coming from the lake. Looking out of his shelter he saw what looked like a large rowing boat moving slowly through the mist. He said he could clearly hear the sound of the oars in the rowlocks. - Another member while night fishing woke up for no apparent reason so decided to get up and answer a call of nature. As he stood outside his shelter he looked to his left and saw an old man standing there and looking out over the lake. He said his face was completely white. He jumped back in the shelter to get his torch but when he came out a few seconds later the old man had dissappeared. - My own experience of strange happenings occurred when I was fishing there alone one night. The lake is in a very rural area with no surrounding lights so unless there is a full moon its always very dark as it was on this particular night. Once again, I woke up for no apparent reason at about 2 am so got up to have a look across the lake. As I did something made me look to my left and about 50 yards down the bank saw a bright white light shining from the bankside. I then heard a voice call out. That was the really scary thing as what the mystery voice was calling was my own name. There have been several other instances of unusual things happening and some of the members have been so shaken that they will no longer fish the lake at night. All very strange but true. Haunted or not I take it its a syndicate water! I love old Essex Estate lakes. SteveW wrote: - My own experience of strange happenings occurred when I was fishing there alone one night. The lake is in a very rural area with no surrounding lights so unless there is a full moon its always very dark as it was on this particular night. Once again, I woke up for no apparent reason at about 2 am so got up to have a look across the lake. As I did something made me look to my left and about 50 yards down the bank saw a bright white light shining from the bankside. I then heard a voice call out. That was the really scary thing as what the mystery voice was calling was my own name. ......bloody double-glazing salemen just don't know when to give up!